BIZDIAGNOSTICS is a unique system designed to allow companies to carry out independent organizational diagnosis and evaluate management performance. Organizational diagnosis is a process aimed at identifying problems preventing a company from operating and developing normally. The system is intended for business owners and managers interested in business development. Investors may also find it useful when evaluating a company and deciding whether to purchase it or make an investment. Conventional organizational diagnostics procedures are complicated, time consuming and involve outside consultants. 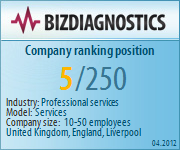 With BIZDIAGNOSTICS, any manager can carry out organizational diagnosis of their company quickly and independently. Using special tests BIZDIAGNOSTICS evaluates various aspects of a company’s management system such as business processes and organizational structure, providing an objective assessment of the system. 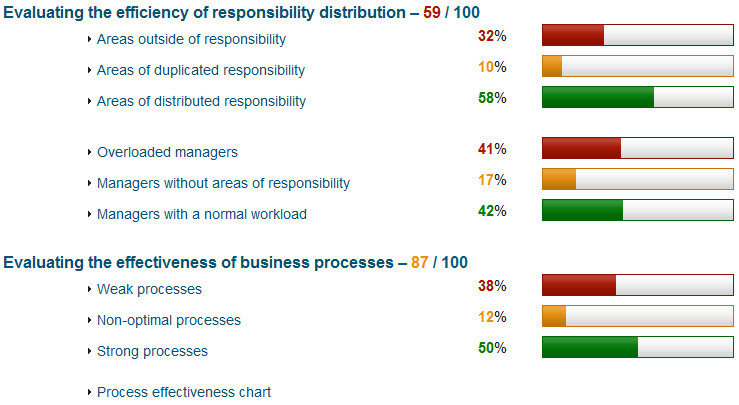 This test is designed for assessing the efficiency of distributing responsibility among managers and identifies intersecting areas of responsibility, areas that lack responsibility as well as overloaded managers or those with no responsibility at all. Managers of all levels participate in the test. identifying stable, smoothly running business processes. All managers and employees who are able to provide an objective evaluation of business processes participate in the test. 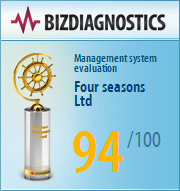 Based on the results of organizational diagnosis, the BIZDIAGNOSTICS system calculates a total score indicating the efficiency of your company’s management system. Outstanding companies will receive a certificate featuring a Gold or Silver Ship’s Steering Wheel confirming the high efficiency level of their management systems. The BIZDIAGNOSTICS system gathers detailed information about strengths and weaknesses of your company’s management system. Each negative indicator may be examined in more detail to determine possible causes of problems. Moreover, BIZDIAGNOSTICS gives recommendations for correcting them. Benchmarking allows you to compare the results of evaluating your management system with those of other companies and identify your rating. Comparison can be made with all companies or those within your region, industry and size. Find out whether you are among the leaders or if your competition is ahead of you!